Since February, my colleague Amye McCarther and I have worked with CALL Project artist Bert L. Long, Jr. Bert is a larger-than-life figure here in Houston, and his autobiographical artwork has reflected his many triumphs and tribulations, including his previous career as an award-winning executive chef, his struggles as an African-American artist in the South, and his six paradisiacal years living and working in the Spanish countryside. His body of work is incredibly varied, ranging from paintings, sculptures, and prints, to large-scale installation pieces. 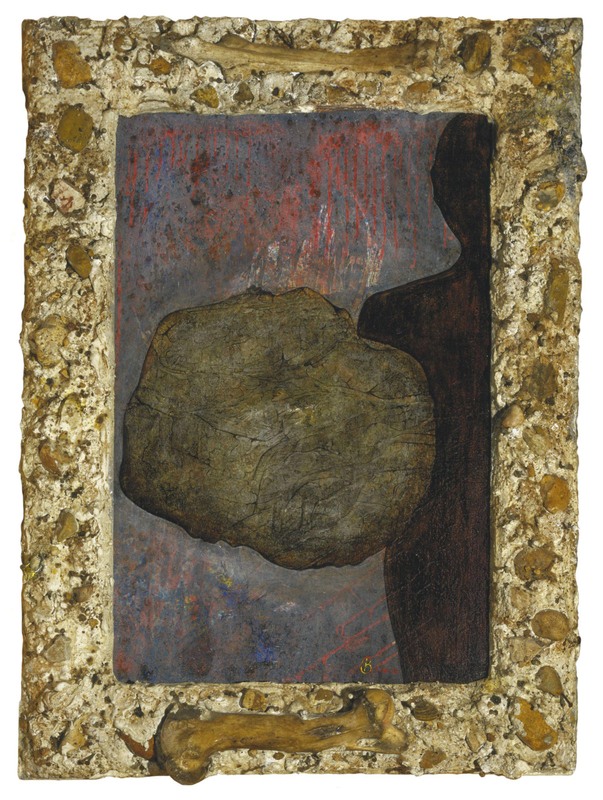 In fact, with his habit of embedding both two- and three-dimensional objects in his canvases and their ornate plaster frames, it’s often hard to decide whether a particular work is a painting or a sculpture. He might be best known as the country’s leading artist working with ice; his immense multi-colored installations in Oakland, Providence, and all over Texas have required as much as 150,000 pounds of it before melting away. Much of Bert’s artwork draws from its own language of representational imagery including swollen hearts, watermelons (whole and sliced), Cheshire cat smiles, artists’ palettes, and most notably, large, staring eyes. Over the past six months, Amy and I have come to know Bert well. He and his wife, the artist Joan Batson, have treated us like members of their extended family. There’s always a glass of juice ready for me, and coffee for Amye, when we arrive; as spring turned into summer we began leaving with bags of produce from the garden at the end of the afternoon. Bert has come to trust us with the contents of his studio and his computer. Not only have we made great strides in documenting and organizing details about his artwork, we’ve also dropped off dry-cleaning and helped make arrangements for the replacement of the air conditioning system in his studio that will allow him to carry on with his work during Houston’s unforgiving summer months. There’s an immediate practical application for our work in that Bert’s career will soon be chronicled in a book now being organized by the Houston Artist Fund. While Bert has assiduously photographed and kept records of his work over the years, the information and images not always been linked together. To properly caption the works to be reproduced in the “Big Bert Book” (as we’ve been calling it), we’ve catalogued some 700 original works, attempting to pair scanned slides and digital images with the correct titles, dimensions, media, and ownership information culled from folders of yellowing exhibition checklists. In many cases, it’s the first time the images have been matched to information about the works, and since Bert has produced hundreds of pieces each year, sometimes it’s required some detective work to figure out which work is which. If Bert can remember a work’s title, or if we can find it reproduced in a book or catalog, or if we can make out the date beside the signature on the image representing the work, usually we can find the matching information fairly readily. In other cases, things aren’t quite as straightforward. We might possess a work dated only “1977″ that measures 16 by 24. 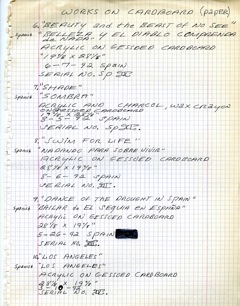 Consulting the logbook, we find listings of only three works made during that year with those dimensions. Sometimes that’s enough to jog Bert’s memory and pinpoint the work’s title and specific date of creation, or we can find the information through the process of elimination. For some works, we may only have details from the logbook or an exhibition checklist, but not an image of the work itself. We’re entering whatever information we do have into the database and hopefully we’ll be able to track down an image through a presenting institution or from Bert’s network of collectors. Inevitably, there will be works for which we’ll never have images, and images for which we’ll never have specific dates, materials, and dimensions. But we feel strongly that all should be represented in the database, which will serve as a searchable, electronic catalog raisonné of Bert’s life’s work. 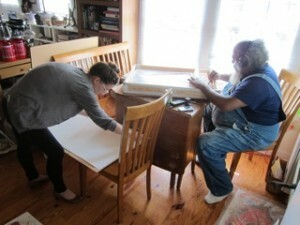 Amye McCarther adds inventory numbers to a series of prints as Bert signs them. In the months ahead, we plan to visit with some of Bert’s prominent collectors so that we can examine works first-hand, confirm dimensions, assess condition, and reshoot works for which we’d like better images. We’re in the process of assigning unique inventory numbers to each work for whom we have information. For most artists, and especially for Bert Long, there’s a story behind every work of art. Bert has given many interviews over the years, including a very lengthy one for a city-funded oral history project archived at the website of the Houston Public Library. But I have found that while I’m working at Bert’s, it’s worthwhile to have a digital recorder running (a practice he enthusiastically supports). I use a Tascam DR-05 which I picked up a couple of years ago for around $150. It’s very user friendly, and you can import high-quality WAVs directly to your desktop. Then you can easily trim excerpts with a free sound processing program like Audacity, and these clips can then be linked to the database. 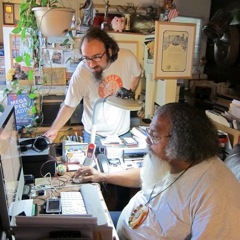 I also bring by Canon PowerShot S95 to take photos of his studio space and office, and to take video during discussions where he’s describing specific events, works and techniques. I feel these audio and video documents will be so important for future researchers of Bert Long’s work. Here’s an example, recorded on May 1st, 2012, in which Bert describes his first gallery showing in Houston in at the University’s O’Kane Gallery in 1979. 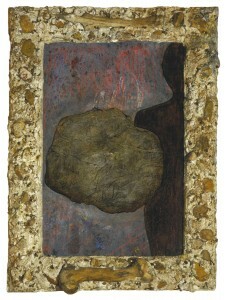 Bert Long: Audio of Recollection of exhibition at O’Kane Gallery in 1979. Bert’s had a long career and he’s saved a lot of material, so while we’ve made a lot of progress, there’s still so much more to be sorted, catalogued, scanned and preserved. We look forward to continuing to share our progress with you as the work continues!